... 1956 (55 years ago today), a musical entitled My Fair Lady made its Broadway début. In the lead role was 20-year-old Julie Andrews, who played the Cockney flower-seller Eliza Doolittle, who endures indoctrination, by crusty Professor 'enry 'iggins (played by Rex Harrison), into the ways of a British gentlewoman. 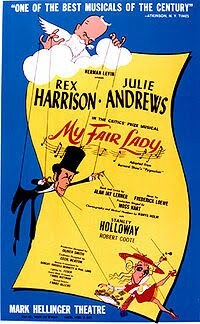 Based on George Bernard Shaw's Pygmalion, Lady would run for a then-record 2,717 shows, enjoy many stage revivals, and be reprised in a 1964 film starring Audrey Hepburn (prior posts).